Remove the motorcycle wash plug before starting engine! PACKAGE INCLUDE - 2x Wash plug, 2x Streamer. WASH PLUG Fit (1.07" - 1.85"), please REMOVE THE EXHAUST PLUG BEFORE STARTING ENGINE please. WASH PLUG keeps water and moisture and foreign objects from entering your exhaust tube. Exhaust Wash Plug Prevents humidity from entering the pipe as it cools down and condensation. 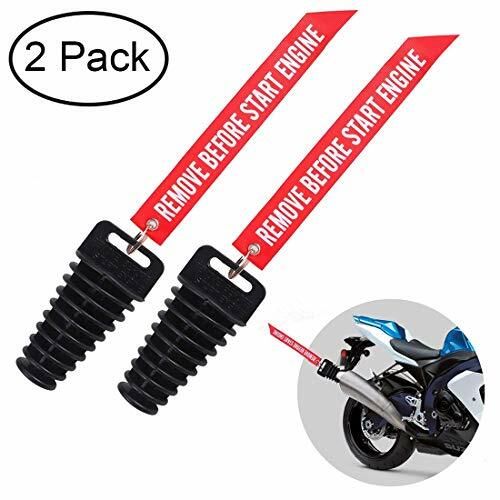 AWESOME LOOK, Come with "remove before start engine" streamer, it will remind you to remove wash plug before you start. DURABLE SOFT SILICONE PLUG, easily conform and stick in the pipe. If you have any questions about this product by DEALIKEE, contact us by completing and submitting the form below. If you are looking for a specif part number, please include it with your message.